Go ahead and scroll down below the video to begin learning more about the latest version of the Nissan Armada. It's our job to equip Nissan reviews drafted by the best automotive writers in the business - it's just one of the things that makes us a premier Nissan retailer in Albuquerque. Everything perspective car buyers need to make intelligent decisions is right here - each passage is crammed with [helpful material and specs - all at your fingertips. 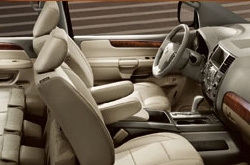 Read on to see if the 2013 Armada should be parked outside your home. 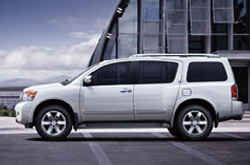 Comparing the 2013 Nissan Armada to against vehicles like the 2013 Buick Enclave, Toyota Sequoia and the Ford Expedition, and you will realize that the 2013 Armada ranks above the competition in quite a few areas. See our bullets to see why! Reliable Nissan auto repair and service in Albuquerque is just a click away! Your Nissan deserves to be treated properly - that means Armada factory- trained Nissan technicians, the peace of mind that comes from a 12-month service work warranty and accredited Nissan parts and accessories. When you bring your Armada to our auto repair division in Albuquerque, you'll get quality service from our skilled mechanics. For regular oil changes and other Nissan services like air filter fixes and battery replacement, come to us. We even take care of more time consuming endeavors with finesse, including jobs like engine repair. Reliable Nissan is your best bet in Albuquerque for quality, professional Nissan repairs and routine maintenance. Find out how much you can save on your next service! Just follow the link below.